The variety of beers on was a bit ordinary and samey to other places. However there was TV so at least it was a conducive drinking atmosphere. 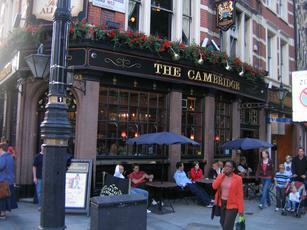 A great place for people watching, its right on Cambridge Circus. One can sit on the high Stools next to the bar for an outside view or in the Summertime next to the pavement. Always an interesting choice of guest Beers, Yesterday I enjoyed a Pint of "Butty Bach". 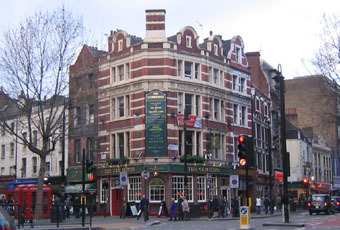 Enjoyed a Pint of London Pride and a meal of Pork and Lamb balls with mash here recently, both were excellent and the Meal arrived quickly . 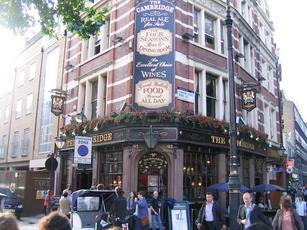 Bounded into the Cambridge at 7.38 on 30/12/11 with two young Parisians on a Soho crawl. We all enjoyed glorious halves of Wherry. 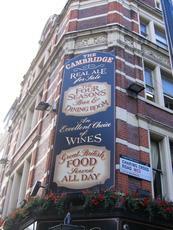 A terrific boozer, my original rating of 10/10 remains!! I'm amazed I've never been here before. But I believe last night was my first ever visit. 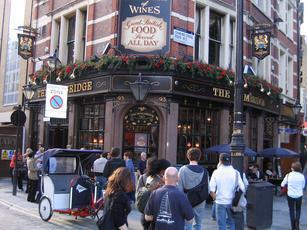 As usual, the West End was very lively and this small pub was no exception. A better than expected range of ales was being dispensed - Keltec King, Sharps Doom Bar, Adnams Ghost Ship, Woodfordes Wherry, Fullers London Pride & Brentwood Spooky Moon. Cider was Aspalls. All drinks were being served in plastic glasses due to a dishwasher fault. I may come back here as the drinks range is a bit better than most over choices in the area.